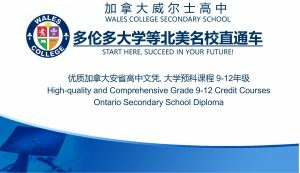 Wales College Secondary School provides high-quality and comprehensive Canadian high school credit courses, excellent staff and faculty; modern teaching methods and facilities, thereby helping students to enter top American and Canadian universities successfully. With international prestige, Wales College is located in Toronto, Ontario’s provincial capital. Our high school is complemented by being an authorized SAT test centre and IELTS test venue and information centre, further enabling our students’ admission to top Canadian and American universities. All courses at Wales College are certified by the Ontario Ministry of Education and graduates are awarded the Ontario Secondary School Diploma. This diploma and its accompanying academic transcript are recognized and accepted world wide. Historically, 100% our graduates got accepted by top universities in Canada. 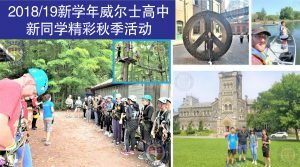 Wales College is a semestered, coeducational, day school located in Toronto, Ontario, Canada. The school provides our high school students with a structured environment, small classes and experienced and dedicated teachers. Wales College is registered with the Ontario Ministry of Education. Our Ministry of Education school number (MIDENT) number is 669384. We offer approved high school courses at the grade 7 to grade 12 levels. University Preparation and University/College Preparation courses are offered at the grades 11 and 12 levels, as described by the Ontario Ministry of Education. The Wales College school environment is warm, caring and inviting. Emphasis is placed on the individual student. Our school is a full service facility. We are willing to meet all of our students’ needs. If you have any concerns, please discuss these with a counselor, your teacher, or the principal. We are all here to assist you. Wales College has several semesters each year. With a flexible schedule students can begin studying here at almost any time during the year. We invite you to discuss your requirements with one of our admissions staff members. Please note that all of our academic courses meet the 110-hours of instruction as set out by the Ministry of Education. 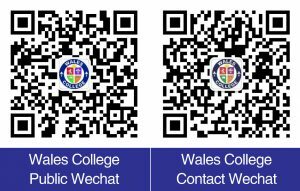 We want your experience at Wales College to be a successful and enjoyable one!